The U.S. Army Engineer Research and Development Center (ERDC) is leading research using seismic-infrasound-acoustic-meteorological (SIAM) arrays to determine structural characteristics of critical infrastructure. Fundamental, vibrational modes of motion for large structures, such as dams, are usually in the sub-audible, infrasound frequency range. Infrasound is low-frequency, sub-audible sound, traditionally defined to be between 0.1 to 20 Hz and below the range of human hearing from 20 Hz to 20,000 Hz . To validate the concept and its potential use for monitoring flood control structures, a structural evaluation was conducted at the Portugues Dam in Ponce, Puerto Rico. The dam’s dynamic properties were studied prior to the deployment of SIAM arrays using detailed finite element models (FEM) assembled in COMSOL Multiphysics software . The natural frequencies of 4.8 Hz and 6.7 Hz, respectively, were determined for the lower modes of vibrations, shown in Figure 1. To validate the results from the FEM dynamic analysis, Performance Based Testing (PBT) was conducted at the dam. The PBT consisted of measuring the crest input and output response to an ambient excitation using an array of accelerometers along each monolith. Power Spectra Density (PSD) analysis of the data from accelerometers was used to confirm the natural resonance frequencies in the dam (Figure 2), and was also used to develop an estimate of the response shape associated with the fundamental modes of vibration developed in the FEM (Figure 1). Figure 2. Power Spectra Density (PSD) analysis from accelerometers gages due to ambient excitation of the dam. Instrumentation for a SIAM array consists of five IML infrasound sensors each with four porous hose wind filters (Figure 3), three audible microphones, a 1 Hz triaxial seismometer, and two RefTek 130s digitizers. To triangulate the specific source location of the infrasound, at least three SIAM arrays are required during the field data collecton. Typically one array in deployment also utilizas a bi-level meterorogical station. Figure 3.Example of one SIAM array used during test in the Cerrillo area. 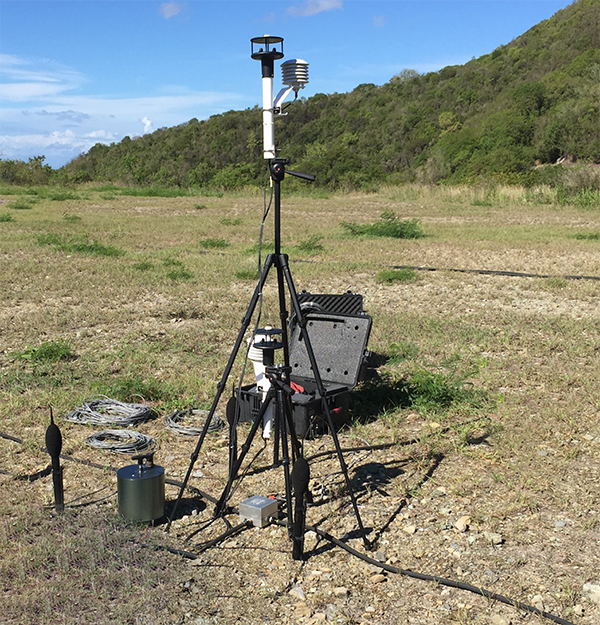 A total of three SIAM arrays were used to monitor the dam at distances of 0.46 km Upstream (CPBBR), 0.2 km Downstream (Gazebo), and 6.0 km (Cerrillo) from the dam as shown in Figure 4. Figure 4. Illustration of the SIAM array location during the data collection. An example time-series from a single infrasound sensor at the downstream array with ambient excitation highlighted is shown in Figure 5. 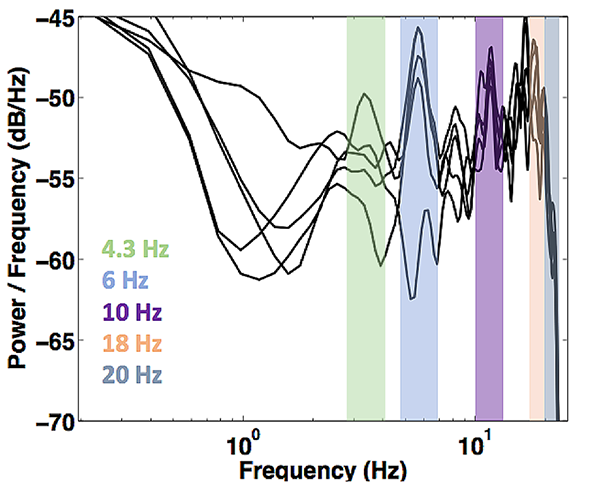 The PSD analysis for ambient excitation in Figure 6. shows correlated energy at frequencies 4.3 Hz and 6.0 Hz, which align with the vibrations modes measured on structure with acelerometers. Results from both the FEM using COMSOL Multiphysics agree with the infrasound field experimental data and were used to validate to SIAM array data collected. Figure 6. PSD analysis from infrasound sensors, located at the Downstream array, ambien excitation. Performing an infrasound survey of Portugues Dam provides an opportunity to validate whether infrasound’s can be used to remotely determine the fundamental frequencies of vibration of large structures. Infrasound waves are capable of propagating at a significant standoff distance from the source structure. Potential benefits of infrasound monitoring include the determination of a structure’s health without a physical inspection and also passive monitoring of several structures of interest using relatively few SIAM arrays. P. Campus, D. R. Christie, “Worldwide observations of infrasonic waves” in Infrasound Monitoring for Atmospheric Studies, edited by A. Le Pichon, E. Blanc, A. Hauchecorne (Springer, Dordrecht, 2010), pp. 185–234.